You can use this overlay to develop a cover that will fulfill the guidelines for Amazon’s KDP print books, CreateSpace, and as the base for creating your IngramSpark 6×9 books. You will still need to download IngramSpark’s own template for final placement, though. 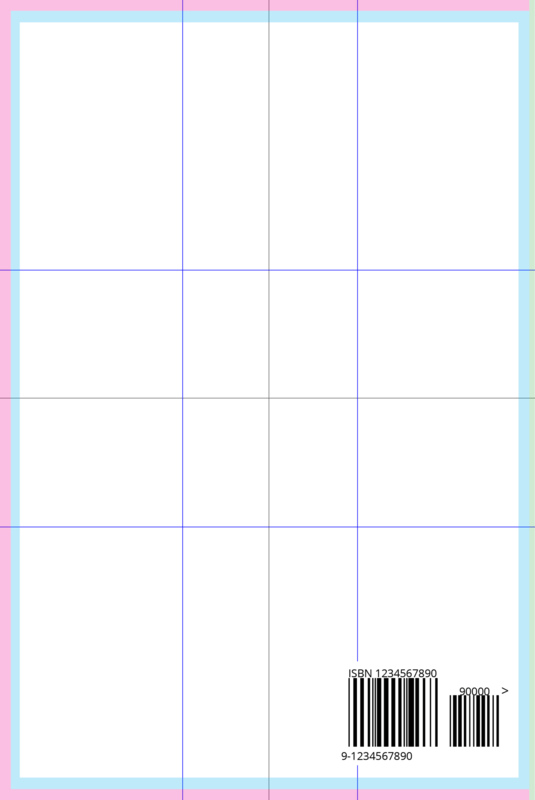 Here you can see the template overlay in action. The outer pink zone is what will be cut away by the printer. This is called the bleed. The outer blue zone is the margin. You need to make sure that no important text is in that blue zone. A good design will make sure that the text uses a zone that is 3x times that, but .125″ is the bare minimum (or .25″ from the bleed’s edge). The ISBN is fake and is just a placeholder. CreateSpace assigned ISBNs are 2″ wide, 1.2″ tall, and are placed .25″ up from the bottom and .25″ to the left of the spine. I have segmented each side in halves and thirds. Because the pink zone is cut away, it is not taken into my segmenting consideration. 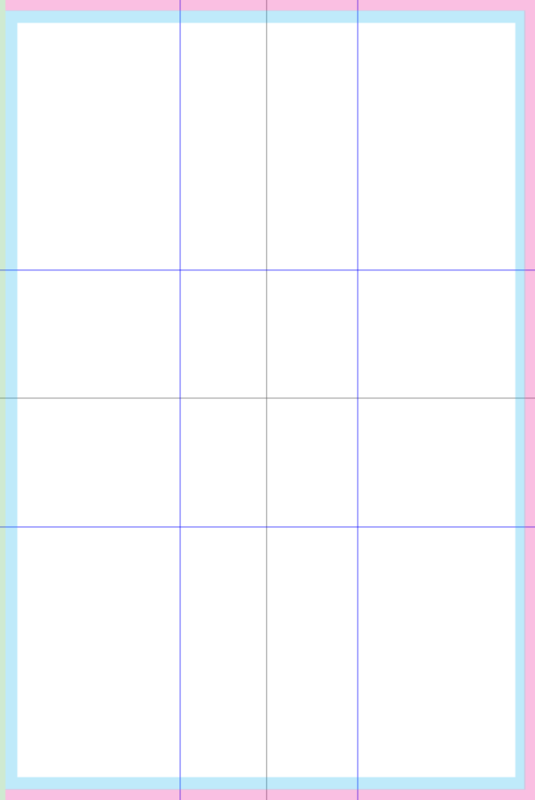 The gray grid lines denote halves. The blue grid line denotes thirds. CreateSpace requires a book to be 130 pages in order for it to get text on the spine. A spine width of .3″ is for a page count of 134 pages (black and white interior on white paper). Use my spine width calculator for CreateSpace here. 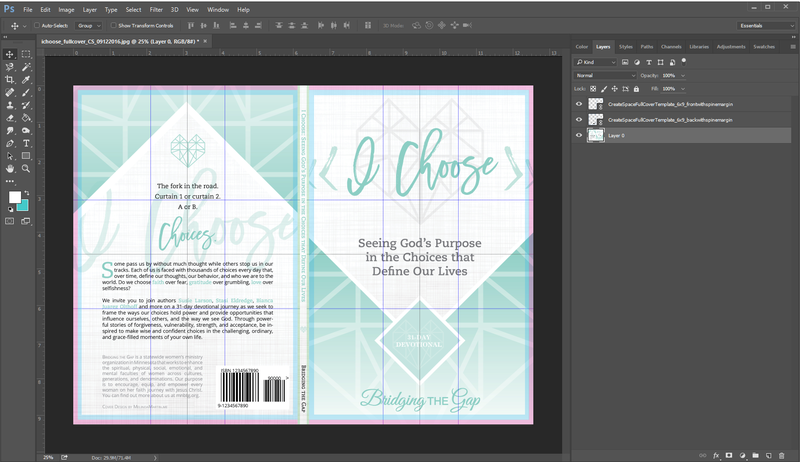 Even though you really should be creating your covers in Adobe InDesign, these overlays will provide help for those of you who have not made that leap yet. I am self-taught and found David Blatner and Anne Marie Concepcion’s courses on Lynda.com to be super helpful. They manage InDesignSecrets.com and are an amazing asset to the publishing community. These overlays are created at 300 dpi and are transparent. Overlay them on top of your design in progress. Simply turn them off or delete them when you’re done and are ready to export the final cover. They can be used in Photoshop, Canva, etc. The pixel dimensions are in the title names, but the single side overlays are 1838 x 2775 and your canvas should always be set to 300 dpi for print projects. I know this will help many of you, and I would have loved to have had them when I first started learning.